Thomas WATSON was born on 2 May 1854 in York Street, Ayr, Ayrshire, Scotland to Thomas WATSON and his wife Mary HUNTER, tenant farmers. 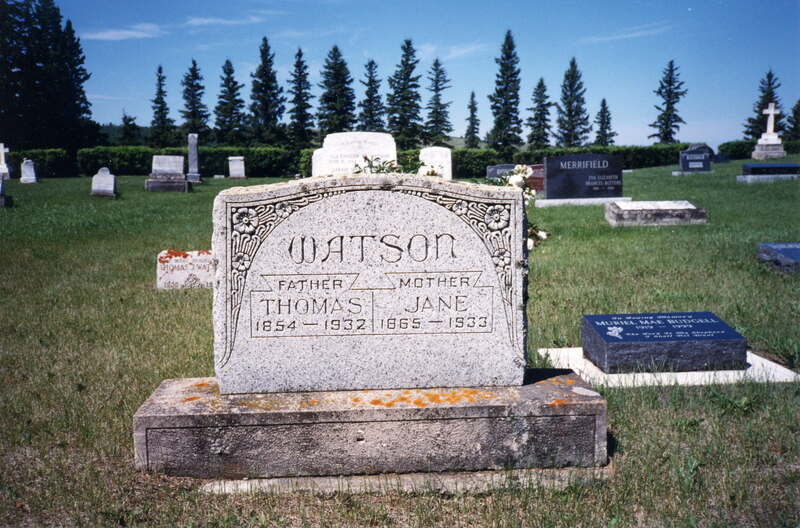 By 1858 the family had grown to four children, Thomas’ older half-brother William WATSON (1847-1878) and younger sisters Janet WATSON (1856-1935) and Isabella WATSON (1858-1904). The Watson family lived on several farms in the Ayr area. In 1861 The family lived on Mosshill Farm in Alloway Parish, Ayrshire, Thomas (the father) was a “farmer of 60 acres” and both a farm servant and domestic servant were employed. By 1878 the family lived on Mount Oliphant Farm just outside Ayr. That year Thomas’ father Thomas died of “paralysis of the brain”. Thomas registered his father’s death and took over running Mt. Oliphant. By 1881 the farm has increased in size and Thomas was “farmer of 70 acres” and two farm servants, and a domestic servant were employed. A boarder also lived at the farm, probably to help with the family income. On 20 January 1887 Thomas, 33, married local girl Jane MUIR. They lived at Mount Oliphant Farm for the next five years, the first three of their children were born there. Although Mount Oliphant was considered to be a poor farm the family managed to scrape out a living. Thomas also worked as a carter to augment the family income. By 1895 the family had left Mount Oliphant and for the next fifteen years lived and worked in at least seven different farms throughout the Scottish Lowlands. 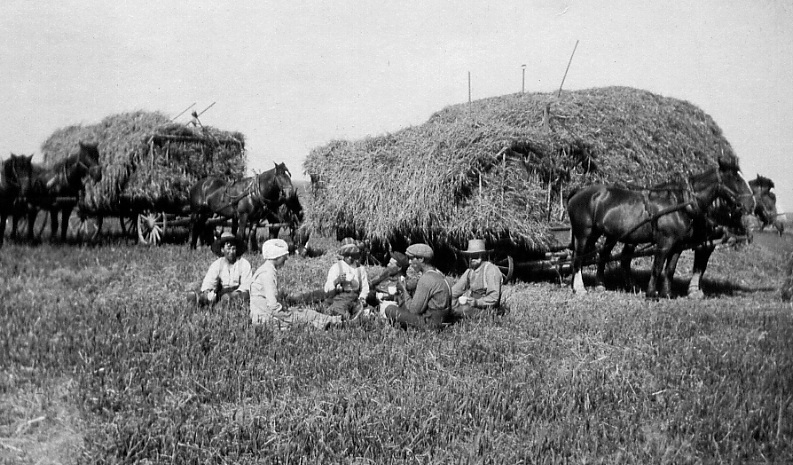 The last farm before emigrating to Canada in 1910 was Clark’s farm in Gullane, Scotland. Thomas took on different farm related occupations to support his growing family: dairyman (1897), ploughman (1899) and again dairyman (1903). Family stories indicate that Thomas enjoyed music; descendants of Thomas have a fiddle as a family heirloom that it is believed belonged to Thomas. This is supported by an old photograph (left). The man with the fiddle looks like Thomas with his bushy sideburns. The photographer’s name place the photograph in Scotland, however more specific date and location are unknown. If it is Thomas in the photo it seems likely that his wife Jane is one of the women seated in front. Photo right: enlargement of man with fiddle. Bushy sideburns and mustache identify Thomas. In 1910, at the relatively advanced age (for those times) of 56, Thomas, his wife Jane and children Alexander, Helen (Nell), Jean and John sailed for Canada. Two sons, James and William, had emigrated previously. The move was successful; although he never owned land himself he lived to see four of his sons become landowners. In later years he told his family that he wished he had moved to Canada twenty years earlier. 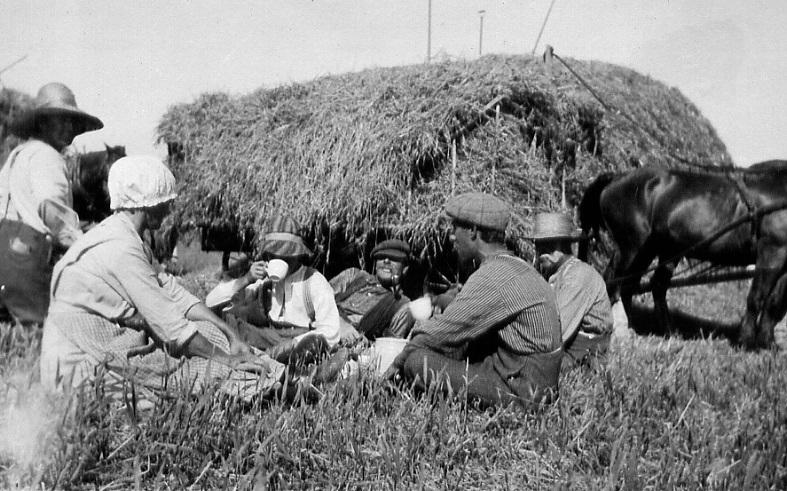 Photo left and below: The Watson family in Saskatchewan, about 1918, taking a break from harvesting. In the photo below, Thomas is the man on the far right, with the brimmed hat, his prominent side burns can be seen. Other people in the photograph unidentified. Photo below: Thomas with his sister Janet (WATSON) SPIERS and his brother-in-law Gilbert SPEIRS, photo probably from the 1920s, on the Campbell farm in the Rosewood district of Sakatchewan. Gilbert always had his corncob pipe. According to family stories, Thomas was a ‘dour’ Scot, some would say “an ornery old cuss“. His memory may have become confused in his later years, although this perception may have been also due to his opinionated personality which sometimes rubbed people the wrong way. Forty years later, his grandson Tom related the story: “I remember one time a remark, something had come up, Grandpa Watson had some shares in, I think, the United Grain Growers or something. There was an annoucement that came out in the newspaper that they were going to do something with these shares. And it was the only time I remember grandpa getting on the phone. But he got on the phone and he phoned his son-in-law Joe Acton and asked about these shares, probably asked what he should do with them. And whatever remark he made was quite ridiculous and someone’s comment was “I think Grandpa is getting into his second childhood.” Of course, at the time, that was often said, you got old and you went into your second childhood. And someone else made the comment “he’s been in his second childhood ever since I have known him”.” At the time, Thomas was probably in his late 70s and possibly was becoming confused, or at least more inflexible in his outlook on life. He died as a result of diabetes that he didn’t take care of. I can remember him making a remark several times saying “well, I’m ready for my hole in the ground”. He more or less said that he would welcome death because he was not going to put up with these damned needles and eating bread that was cooked with no-starch flour and that sort of stuff. In those days you had to cut out all starch. I remember going one evening with my mother [Helen (Nell) WATSON] and Grandma Watson [Jane MUIR] was pretty discouraged. My grandfather had just been told by the doctor that he had diabetes and told how he had to change his diet. He had been given this flour as in those days you weren’t supposed to eat starch or sugar. You were supposed to bake bread with this flour that had no starch in it. Well you can imagine baking bread with no starch. Grandma Watson showed us what she had just baked, they were supposed to be buns but they were as flat as pancakes and hard as a rock. Grandma showed this to my mother with the comment “you may see what it’s like …”. And poor Grandma, I felt sorry for her even as a young boy. She was so discouraged. And of course there was no way he was going to eat that crap. He never did. He wanted his porridge and his sugar – even if it killed him that’s what he wanted. He went into a coma March 1933. And died. They had a doctor out [from the town of Lemberg] and the doctor said” there’s nothing I can do, it’s inevitable” And he died within 24 hours. [Obituary from Lemberg Star, Mar 11, 1932, Vol 14, #32] A highly respected and aged citizen of Rosewood district, passed away at his home on Sunday, March 6th, in the person of Thomas Watson, aged 78 years. 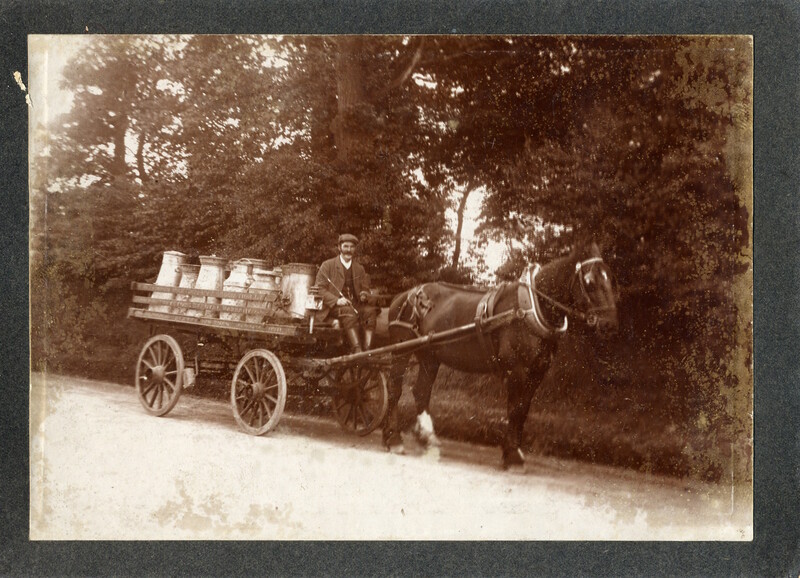 The late Mr. Watson was born near the town of Ayr, Scotland and with his family, settled here in 1910, where he has since engaged in farming with a fair measure of success. He is survived by his widow, two daughters, Mrs. Jos. Acton, Lemberg and Miss Jean, Regina, also five sons: Thomas, Winnipeg; James, William, Alex and John of this community. One sister, Mrs. G. Spiers [Janet WATSON, married to Gilbert SPIERS] who resides in Ellisboro. The funeral took place on Wednesday afternoon, following service at the late home, burial being made in Ellisboro cemetery, conducted by Rev. H. Cobb of Wolseley. The pallbearers were his five sons, Thomas, James, William, Alex, John and son-in-law Joseph Acton.